Champion sprinter Roy H put on a clinic Jan. 19 at Santa Anita Park. The 7-year-old More Than Ready gelding didn’t seem to require much direction from jockey Paco Lopez in the $200,000 Palos Verdes Stakes (G2), his first start since notching his second consecutive win in the TwinSpires Breeders’ Cup Sprint (G1) Nov. 3 at Churchill Downs. With the cool poise of a seasoned professional, Roy H cruised in a perfect stalking spot just outside the leader, inhaled that rival around the far turn, and drew off under wraps in a sparkling final time of 1:08.89. Click here to read article from BloodHorse. Roy H broke sharply from the far outside in a field of six older horses, tracked his fellow Peter Miller trainee Conquest Tsunami and rival St. Joe Bay through a quick quarter in :21.44 and a half in :44.35, reeled in those two heading into the far turn, and galloped the final furlong to win in hand. 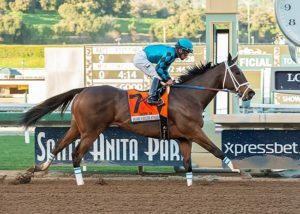 Roy H took the Palos Verdes for the second straight year, adding to a résumé for Gary Hartunian’s Rockingham Ranch and David Bernsen that includes seven graded scores, four of them grade 1 events. His record stands at 10-5-2 from 23 starts, with earnings of $3,139,765. Sent off as the 1-5 favorite, Roy H paid $2.60, $2.10, and $2.10. Kanthaka, making his first start against older horses, closed to overtake Conquest Tsunami late for second. It was 1 1/2 lengths back to the pacesetter, who rounded out the trifecta. “You could see going to the three-eighths (pole), he was just cruising,” Lopez said. “He loves to run, and I had a whole lotta horse the whole way. He definitely ran as good today as he did in the Breeders’ Cup. He was just incredible. Roy H was bred in Kentucky by Ramona Bass out of the Elusive Quality mare Elusive Diva, and was a $310,000 purchase from Wavertree Stables’ consignment to the 2014 Keeneland April 2-Year-Olds in Training Sale. Ciaran Dunne pinhooked him to the sale after picking him up for $115,000 at the 2013 Keeneland September Yearling Sale, where he was consigned by Claiborne Farm. Last year, Roy H finished third in the Dubai Golden Shaheen Sponsored By Gulf News (G1) at Meydan. After his impressive performance Saturday, a return trip remains in the cards. “We’re gonna try Dubai again, and hopefully we can get it right this time,” Miller said.